FARMINGDALE, N.J., March 5, 2019 /PRNewswire/ -- Dialight (LSE:DIA) today announced the launch of two new snap-in panel mount indicators for application in mounting holes over one-half inch. The new 653 and 654 Series, for 0.57" (14.7mm) and 0.657" (16.7mm) mounting holes, are our first snap-in panel mount LED indicators for mounting holes exceeding one-half inch, filling a gap in the industry for applications in process machinery, warning light panels and other indoor and enclosed applications. Both products are available in red, green, yellow and blue. "Dialight established the LED indicator market with our inception in 1938, and we've continued to set the standard for innovation, versatility and performance over the last 80 years," said Matthew Boudiette, Dialight Vice President and General Manager. 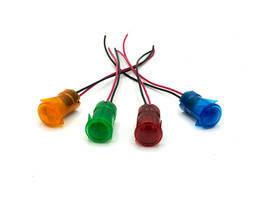 "With these new products, we can now offer our customers the widest selection and longest-lasting LED indicators on the market to meet virtually every application need." The 653 and 654 Series products are terminated with 22 AWGUL1007, have a rated operating temperature range of -20 degrees C to +80 degrees C, and are compatible with 12v and 24v DC drive circuits. To learn more about Dialight's class-leading industrial LED indicator solutions, visit www.dialightsignalsandcomponents.com. Dialight (LSE: DIA.L) is a global leader in sustainable LED lighting for industrial applications. Dialight's LED products are providing the next generation of lighting solutions that deliver reduced energy consumption and create a safer working environment. Our products are specifically designed to provide superior operational performance, reliability and durability, reducing energy consumption and ongoing maintenance and achieving a rapid return on investment. The company is headquartered in the UK with operations in the USA, UK, Denmark, Germany, Malaysia, Singapore, Australia, Mexico and Brazil. www.dialight.com.